The St.Peter Chanel brief asked for a smart and inspiring water feature design that maximized the surrounding open space to its advantage. Viewable from many angles the water features would need to be 3dimensional, make a bold statement and stand out to the children who would constantly pass by the area. LICOM76™ opens up a range of possibilities in designing unique shapes that don't require complicated moulds. This gives our designers the opportunity to develop original concepts that would have proved difficult using traditional building techniques. In this instance the large circular disc concept was developed. To manufacture unique objects from LICOM76™ we produce detailed assembly and manufacturing drawings. This is the first stage in the production of components and is a vital step in our ability to translate concepts into reality whilst also ensuring the quality of the product and that the final component meets its original design intent. 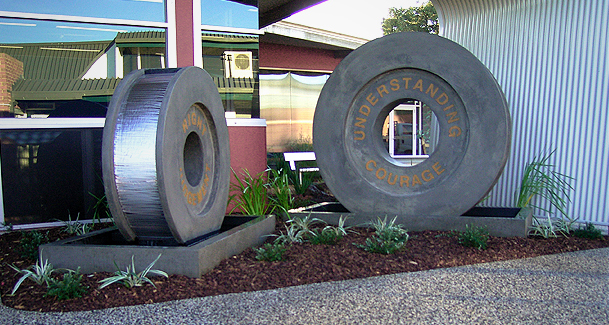 LICOM76™ is a relatively lightweight material in comparison to other concrete products. This allows the majority of installations to be completed by hand without heavy machinery. For this project the ground was first prepared so that each component could be hand lifted off the truck, installed in place and fitted off as required. 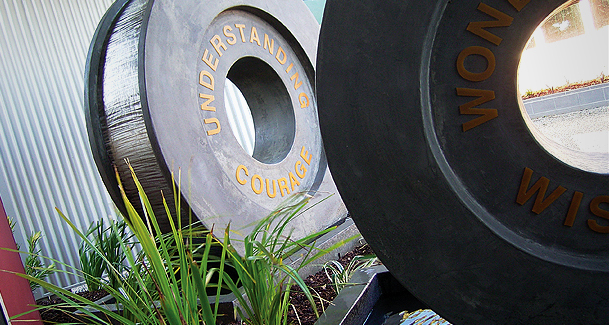 Designed as an inspirational structure for the school children, the St Peter Chanel Primary School water features highlight the ability LICOM76™ has to create large and complex concrete structures without the need for expensive and complicated moulds. In this situation the material has been uniquely applied to one of H2O Designs exciting water feature designs.